People were kind enough to send me messages wondering if the table tennis gene had passed down the generations. I’m delighted to say yes it has, and I am proud to introduce you to Alison Woodland, daughter of my cousin Sue. 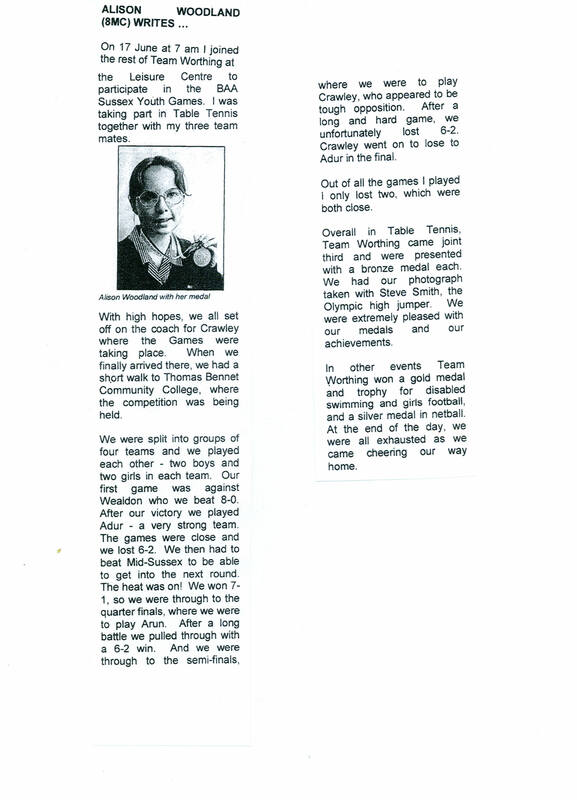 Many thanks to Sue for documenting her daughter’s achievements and writing about them for me. Here is the first of two posts about the next generation. 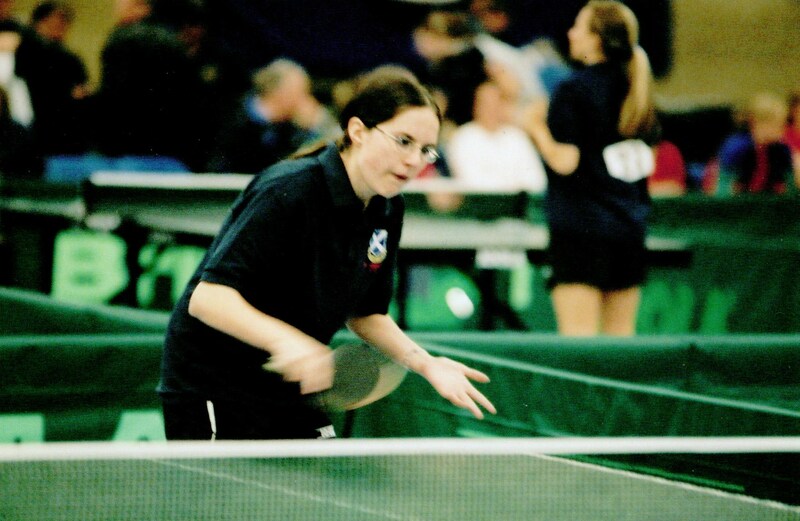 Alison started playing table tennis in 1998 aged 10 when she went to an after school table tennis club at her Middle School, which was run by a local coach. The same year she joined the Worthing Youth League, which was run by the same coach. Teams of 2 played in divisions. Alison played with a female friend, who also went to the after school club. In 2000, they won Division 4, being the first female team to ever win a division. 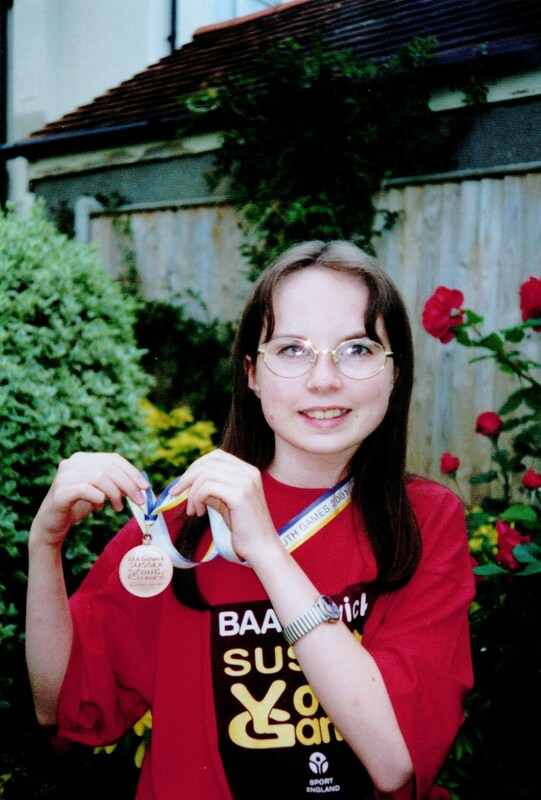 In 2001 she took part in the Sussex Youth Games, in a team of 3, and won a bronze medal. On 17 June at 7am I joined the rest of Team Worthing at the Leisure Centre to participate in the BAA Sussex Youth Games. I was taking part in Table Tennis together with my three team mates. With high hopes, we all set off on the coach for Crawley where the games were taking place. When we finally arrived there, we had a short walk to Thomas Bennet Community College, where the competition was being held. We were split into groups of four teams and we played each other – two boys and two girls in each team. Our first game was against Wealdon who we beat 8-0. After our victory we played Adur – a very strong team. The games were close and we lost 6-2. We then had to beat Mid-Sussex to be able to get into the next round. The heat was on! We won 7-1, so we were through to the quarter finals where we were to play Arun. After a long battle we pulled through with a 6-2 win. And we were through to the semi-finals where we were to play Crawley, who appeared to be tough opposition. After a long and hard game, we unfortunately lost 6-2. Crawley went on to lose to Adur in the final. Out of all the games I played I only lost two, which were both close. Overall in Table Tennis, Team Worthing came joint third and were presented with a bronze medal each. We had our photograph taken with Steve Smith, the Olympic high jumper. We were extremely pleased with our medals and our achievements. In other events Team Worthing won a gold medal and trophy for disabled swimming and girls football, and a silver medal in netball. At the end of the day, we were all exhausted as we came cheering our way home. 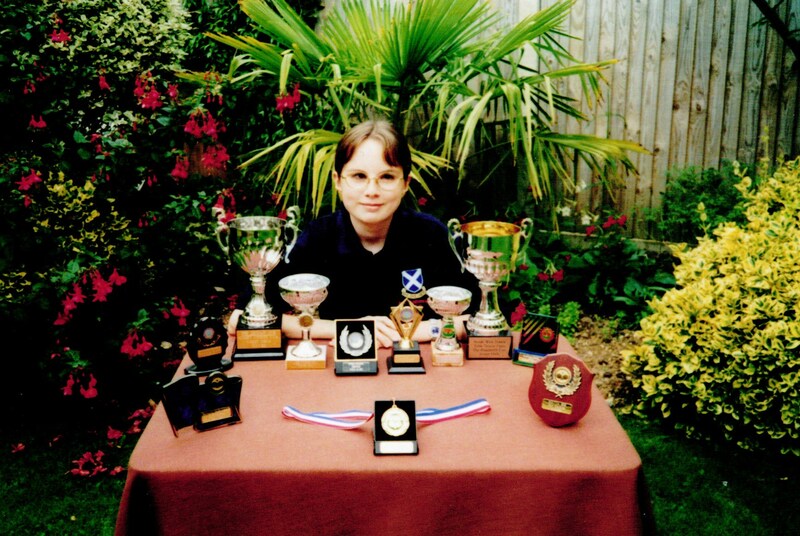 Alison won a number of tournaments in the 2001/2002 season. Many of these were not open to the top 8 ranked Sussex players. At the end of that season (May 2002), having risen to Sussex junior number 5, she played in the Ginnaw and Rymill cups, which were open to the top 8 ranked Sussex players, by invitation only. The Ginnaw Cup was open to cadets (under 15’s) and the Rymill Cup to Juniors (under 18’s). This entry was posted in SPORT, Table tennis and tagged Table Tennis. Bookmark the permalink.